Last season, I opened more than 200 packs (probably closer to 300 "packs") of baseball cards for the "Tribecards from Outer Space" pack-a-day giveaway. Many of those packs had gum. For some reason, only known to my subconscious, I saved nearly every piece of gum that came from any packs that had gum (and that I could actually save). To refresh your memory, some of the packs dated back to 1978 and 1979. Those packs had gum. And, yes, I saved it. Talk about your "Stale Gum!" And, since the giveaway was shared among 30+ hobbyists, I also submit this could be considered "Community Gum" as well. I am not so bold to start slipping these bits of nastiness into participant packages. That's just not right. But, I could not let these fall into the trash bin without posting SOMETHING about them, seeing as how I saved them for some reason or another. Looking at the photo, you can probably guess which pieces come circa the late 70's. Those would be the skinny little grey-ish pieces (concentrated on the left side). The unwrapped darker pieces (like in the upper-left corner) come from the 80's. Notice that some of the gum is actually double-stacked (again, upper-left corner). I guess if we had opened those back in the day, we would have been happy to see a bonus piece of gum in our pack. 30 years later, however, it's pretty gross. In fact, all of it is gross. 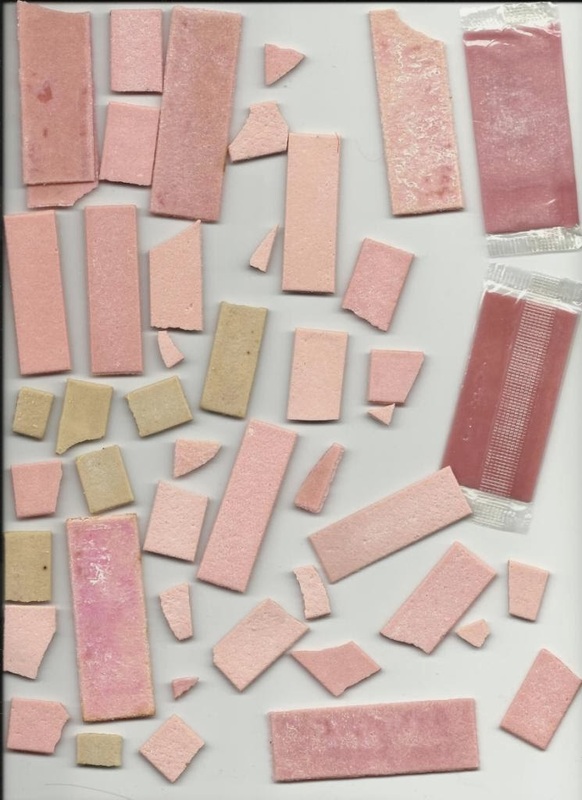 Of course, baseball card gum has always been a little gross, hasn't it? Could we open the wrapped gum and eat it? Maybe. One thing is for sure: gum has gotten longer, wider and thinner over the years. I may have shared this with you before, but I can't remember, so I will share it again... When I was a kid, I would take the gum and break into little pieces. Then, I would stick those pieces randomly into an apple. I would try to spread things out so that I could get a bite of gum with almost every bite of apple. The result was something almost like eating a candy apple. I loved it. My friends just thought I was weird. Some things never change, I suppose.